A Graceful Journey Radio program is where you will hear powerful conversations, insights and knowledge to help you when family caregiving calls. Host, Lorna M Scott brings a powerful combination of experience as a family caregiver and professional expertise as a coach and counsellor. Lorna found her passion helping others discover their own inner power and special gifts. During her personal transition and transformation following the death of her husband, she became passionate about the plight of the caregiver. Her personal philosophy is to have a positive outlook on life with a focus on solutions, not problems. She firmly believes that with the right information, attitude, focus and a belief in oneself, anyone can achieve their highest goals. Lorna knows that these are the keys to unlocking success and receiving the greatest gifts as a caregiver. You will be empowered to meet demands, find balance all while caring for yourself that help you find grace, peace, hope, and joy in your caregiver journey. Join Lorna M Scott and learn more about her journey. Lorna shares how during her personal transition and transformation following the death of her husband, she became passionate about the plight of the caregiver. She firmly believes that with the right information, attitude, focus and a belief in oneself, anyone can achieve their highest goals. Lorna knows that these are the keys to unlocking success and receiving the greatest gifts as a caregiver. Host Lorna M Scott brings a powerful combination of experience as a family caregiver and professional expertise as a coach and counsellor. Host Lorna M Scott introduces you to this formula that gives you strategies to help you create moments of joy and peace. It doesn’t have to be all done at one time. It does give you a framework to use to create meaningful life long memories and avoid dwelling on how much life has changed. Putting this into practice will help you change the tears of sadness from the negative impact of your caregiver role to tears of joy and laughter when you plan for what you can do to bring more peace, joy and hope into your life. Part 2 of the 5 part series of the PEACE Formula. We will be building on the last episode where we talked about being intentional with planning what we want to do, small things and big goals. This episode takes you through the next step, with is “engage.” You will learn who you want to ask for information, who might help you and how the Planning step helps you decide precisely who can help you with your plan. Part 3 of the 5 part series of the PEACE Formula. We will continue to build on the previous 2 episodes where we talked about being intentional with planning what we want to do, and about engaging the people who want to help or who you need more information so that you could set your plan into motion. Step 3 is Action. You have spent a fair bit of time contemplating the things that bring joy to you and the person you are caring for. Up until now we’ve been basically building your “dream” goals. It’s time to move from dreaming to doing. This episode starts to tie together everything you’ve done so far and introduces some tips on successful action, and looking at how to overcome obstacles you may face along the way. Wrapping up the 5 part series of the PEACE formula we will talk about enjoying the PEACE journey. There are bound to be ups and downs in the first 4 steps discussed in the previous episodes. It might even seem like there’s not enough energy to enjoy what you’ve done. Step 5 is all about enjoying the journey. Family caregivers seldom notice their sense of self get whittled away and buried in the chaos of medical appointments, organizing schedules, planning meals and balancing all those other aspects of work, family and life. Learn some simple strategies for you to stay connected to yourself and avoid losing your sense of self, so make sure you are being treated well, with respect, and if you are treating yourself well, and with respect. Shield of Armour - Friend or Foe? Your brain has some pretty powerful ways to protect you from the emotional shock of being suddenly thrown into the caregiver role. Learn about your "shield of armour" and how it can help you get through some challenging times. This episode includes a reading from Lorna's book, Walking the Journey Together...Alone. Tune in to find out the "must haves" of what you should pack in your "caregiver" bag and why it should always be ready to go. Family caregivers usually try to do everything themselves and don't ask for help. Their family and friends want to help and don't know what to do when their offers aren't taken. Learn some simple strategies and tips for the Givers and Receivers of Caregiving. When families are faced with a sudden and unexpected medical crisis, there are bound to be differing opinions and willingness to help. And then there's dealing with the medical professionals. In today's episode Lorna will share some tips and strategies for positive communication with family, employers doctors and other professionals. In today’s world, people want to be healthy, they want to be happy, but instead they are getting stressed out , depressed, getting less sleep, more negative thoughts and feeling isolated. Does this sound like you? Are you someone who wants to move on and bring more laughter and joy into your life? You are in the right place. Laughter Yoga is a revolutionary idea – simple and profound. An exercise routine, it is sweeping the world and is a complete well being workout. Developed by a medical doctor from India Dr. Madan Kataria and it has spread across 100 countries. Join host Lorna M Scott and Special guest Angelique Doyle to discover what Laughter Yoga is and how it can help you! Definition of Christmas Stress: Having two completely opposite thoughts, holiday joy and too many demands lead to contradicting behaviours, trying to do all the right things that will make people happy in the spirit of love and joy, and not giving yourself enough love and joy and in the process. Learn strategies on how to turn that stress into joy, including the one statement you can use to have less stress and more peace this holiday season. Time Out for Holiday Fun! Take time to smile and laugh! Put your feet up and listen to some good natured Christmas jokes and a heart warming story. You can even use the humor and jokes at your Christmas dinner! One of the best feelings in the world is the feeling of gratitude or appreciation. It is central to a balanced life and in a matterof minutes, even seconds, can shift our cells into positive energy. The result? You feel better and can carry on with your day in a happier and successful way. In today's show, you will learn a couple of easy and powerful ways to find gratitude, regardless of how your day is going. Sometimes it's challenging to think about the future when you are truly absorbed in your caregiving life of today. The scene may have changed you might be faced with making significant and emotional adjustments to your life. You don't have to leave it behind. You have the courage and strength to look ahead and choose how you are going to live in 2016 - what is important and what are your next steps to living your life on your terms - and be comfortble in your caregiver skin. Caregiving and Clutter - how clearing the clutter around you and within you opens space within your home, your life and gives you new perspective, and ultimately joy. Whether or not you set New Year's resolutions, it's a good idea to set some goals for the year. They don't have to be huge goals though it's good to have at least one goal that will challeng you a bit. In the unpredicatable world of family caregiving it can seem impossible to follow through on a goal. In today's episode you'll learn how doing the simple act of writing down your goals can lead you to accomplishment, fulfillment and getting what you want. In the wily world of caregiving, getting your message across can seem impossible sometimes. In this episode Lorna will talk about some of the things that can go wrong when trying to find get medical information, figure out appointment schedules, and talk about those scary topics. You will learn about different communication styles, how to clearly ask for what you need and how to decipher what others are mean - which is often different than what they say. When you think about retirement, what is it that you think about? Do you think clearly about the kind of retirement you truly want? Do you think about how you will make your retirement unique, enjoyable and true to your heart? Or do you think of retirement as a time of uncertainty? Perhaps a time of figuring it out as you go. Life has a way of changing and your health will play a major role in your retirement experience. What if you become a caregiver for your loved one? How will this impact your retirement experience? Gary will introduce the idea of planning your retirement from the life perspective and how to see retirement as a time of opportunity and also as a time of major change. He will help you discover what you can do today to be ready should something unexpected happen tomorrow. A little laughter goes a long way! Adults in general forget how good it feels to laugh like a child. Caregivers are sometimes so immersed in their life that they forget about having fun, let alone laughing. My guest, Giggle Guru Angelique Doyle. dispels the myth that we need to act like grown ups, and helps us rediscover our inner child. For some reason it seems that even though we know each of us won't live forever, we don't deal with necessary issues. LISTEN NOW to this episode to find out exactly what things you can take off you place and relieve some stress. Why do some people seem to get so much done in a day? And how do they make it look so easy? Listen in and find out some simple habits that will help you accomplish the most pressing things and leave you feeling satisfied with the day. Getting pulled in every direction is exhausting. Your brain might seem like a hamster wheel of never ending thoughts, worries and emotions. If only you could find a way to slow it down. In this episode, Lorna M Scott, introduces you to the concept of slowing down to get ahead. Stop the hamster wheel and get back in control. Use this one technique to accelerate your goals and dreams. Used by our forefathers for centuries and accepted as standard practice in the world of sports, this techinique is now used by the most successful people in the world and finding its way to becoming a main stream strategy. Listen in to see if you know what it is, and if you do, how to rocket boost what you are already doing! Do you have a question about family caregiving and been too afraid to ask? Lorna answers some of the burning questions on the minds of family caregivers. It's almost impossible to not be affected by the downturn in the global economy. Don't let your health suffer. Learn 12 strategies for saving money on your grocery bill, and 7 traps of grocery stores that take too much out of your bank account. Life can be the best teacher. Lorna reflects back on the highs and lows of her time caregiving for Callum. Lorna shares 3 simple strategies you can use to create meaningful moments in your life, AND offers some questions to consider to gain insight into your life, regardless of where you are on your journey. Special Guest Rosetta Sanders, Certified Assertive Coach and Founder of Today Is...Inc, joins Lorna in the virtual studio. Rosetta has dedicated over 20 years of her life to working with young children. She believes in play based learning that celebrates children’s individual strengths and that they come hard wired to learn what they need to be successful. She now runs her own company through which she offers assertiveness coaching, first aid training and consulting services. Special Guest Janet Wiszowaty, author of Power to Change: Journalling at the Heart of Changing Your Life , joins Lorna in the virtual studio. -give you a safe outlet for your innermost feelings and worries. Returning to the studio is Angelique Doyle, Giggle Guru from Awakened Personal Enlightenment. Angelique is back to lead us through some more laughter yoga and helping us let our inner child out to play. After all you care for them...Help them organize their appointments...support them through the doctor visits....Have you ever wondered why your loved one is never happy with anything you do for them? And why they can't do that one simple thing that will make you feel appreciated? ..... it might be that your love tanks are depleted. Join Lorna and find out how you can fill your love tank. Special Guest Mila Lansdowne, Certified Dream Builder Coach and Founder of the Dream Builder Academy Online, joins Lorna in the virtual studio. Mila has dedicated her life to share her knowledge and expertise on the power of human mind. She is a passionate educator empowering people to acquire understanding so they can take charge of their life by learning the skills that will enable them to turn challenges into life of growth and purpose. Mila offers online courses and coaching for groups and individual to help those who understand the power of support required to master life changes. Donna Kater, author and online video course instructor, joins Lorna today in the virtual studio. Donna is known as a master in reinventing oneself and is dedicated to helping others, particularly after they've gone through something really big, such as a divorce, major illness, or death of a loved one. She hosts an online course called: “I’m Still Alive, Now What? How to Survive and Thrive After a Life-Changing Event” and has written a book with the same title. She shares practical tools about how to heal your past so that you can move toward a brighter future. Today’s special guest is energy expert Julian Kaufman, who helps people get more done with their lives while using less energy. Julian practiced as a Professional Electrical Engineer for over a decade, designing electrical circuits to transmit energy to people’s homes and businesses. Later in his life he reconnected with his own higher power, God, and as a result realized more energy, love and fulfillment. Julian saw how he was a conductor of God’s energy and that there were ways to increase the flow of the divine through him. Wanting to serve others so they can avoid wasting their life energy, Julian developed his Theory of Conductivity and the resulting 4-part framework that will be part of his upcoming book, Let Go, Let it Flow – a P.A.T.H. to Peace and Personal Power. Special guest Brad Rudner is a Certified Transformational Nutrition Coach with degrees in philosophy and education. His passion for health and teaching led him to clinically train doctors in the use of medical equipment in operating rooms and clinics. With his understanding of medicine, health and wellness, Brad developed his MIND approach to transform and energize people naturally through his coaching, teaching and messaging. Visit http://bradrudner.com/ to find our more about Brad and his MIND approach. In Dollar and Good Sense, Debbie Todd teaches simple, short yet effective tools to identify, improve and manage virtually any aspect of your money life that you may find challenging – or that you simply know you want to have stronger stewardship over…but are not sure how to make that happen. Protect your (and your loved ones) money with stronger, practical skills using “Dollars and Good Sense.” After all, it’s your money – your assets – and your life. Have you ever started driving to work or the grocery store and realized you didn’t remember part of the trip? This happens to many people every single day. Your subconscious mind is what is “driving” you when this happens. According to Dr. Bruce Lipton, it is the subconscious mind that is running us about 95% of the time! In this episode, Lorna Scott will share key strategies and tips to consciously, create each day to get what you want and need, and become a Conscious Caregiver. Special Guest: Susan Levin, Author, Nutrition Consultant, and mother of a child who recovered from autism, shares her three-fold approach to transforming families affected by autism. Susan will discuss her personal experience with autism, and offer easy to implement, specific, and inexpensive strategies to begin transforming your family today. Dean Maser is the founder of The Good Ancestor. In today’s show Dean will share his powerful story of success, how good ancestors taught him the mindset and skills to create a better future for himself and others. You will learn how you can leave your legacy by identifying the Good Ancestors in your life, and how you can be a Good Ancestors to others. Today’s special guest, Liz O'Donnel is a working daughter and working mother committed to helping other women as they balance their many roles in life. How does caregiving affect your career? How do you balance your job and your family responsibilities? How do you ask for the flex time you need? Liz runs the website WorkingDaughter.com, which serves as a resource for women balancing career and caregiving; and provides a service that pairs women who need help supporting their aging parents with former caregivers who are looking to utilize the skills they learned during their caregiving experience. Special guest expert Phyllis Young is a board certified Physician Assistant with certification in Functional Medicine and Nutrition. In today's episode Phyllis introduces us to a method of dealing with chronic disease once and for all. She shares the impact of chronic disease and how you can use Functional Medicine and Nutrition to prevent and eliminate chronic disease. Family caregiving is full of unexpected twists and turns, both positive and negative. It is normal for a family to jump from phase one to three or four in a short amount of time. It is also normal for a family to stay in phase one for an extended period of time. The important thing is to know where you are in relationship to how your life is going as you care for a loved one with a life changing medical diagnosis. What You Say To Yourself Does Matter! Laughter Yoga and Vision Board Coach Angelique Doyle from Awakened Personal Enlightenment joins us in the virtual studio to share a powerful technique that will change the conversations in your mind. Words and thoughts are powerful and can change the direction of your life. Tune in to find out more about this proven technique, used by enlightened and successful people all over the world. 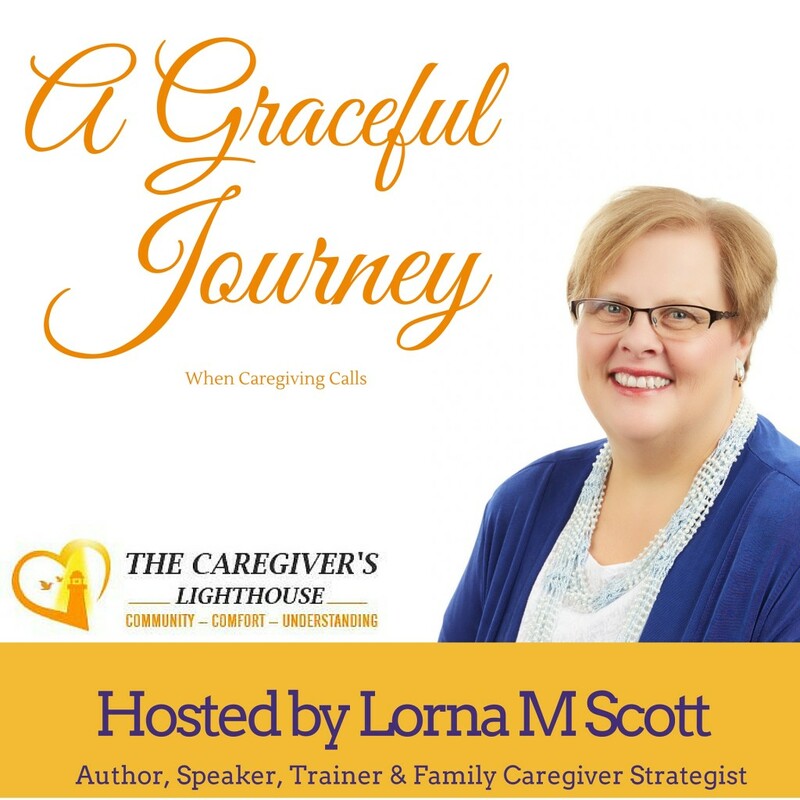 Join Lorna and learn the 3 myths keep you on a dangerous trajectory towards caregiver burnout. Lorna knows from experience, that it is important that you have strategies and support to really pay attention to your health and well being. And she will even share her my top 5 tips that will stop you from going down the dangerous path leading to caregiver burnout. Denise shares insights, inspirations and information to those who care for family members on this week's episode of A Graceful Journey. Elizabeth Miller is a caregiving expert in her own right and on a mission to help other caregivers live a happier, healthier life. Through her experience of caring for her father,mother and mother-inlaw while working full-time, she learned that it's essential for caregivers to avoid caregiver burnout and isolation.